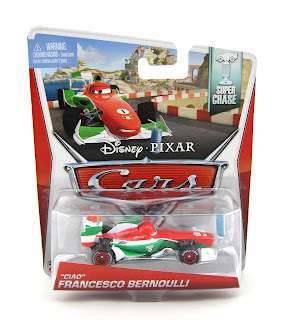 From Cars 2, here we have another "super" exciting new addition to my collection..."Ciao" Francesco Bernoulli! 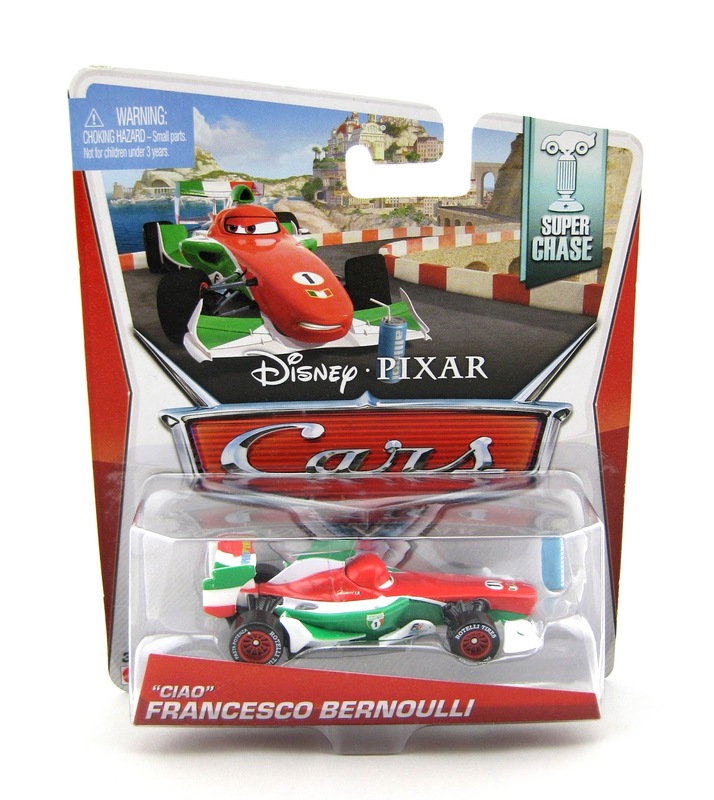 "But there's a million Francesco cars on every toy store shelf!" you may say; and you would be right. 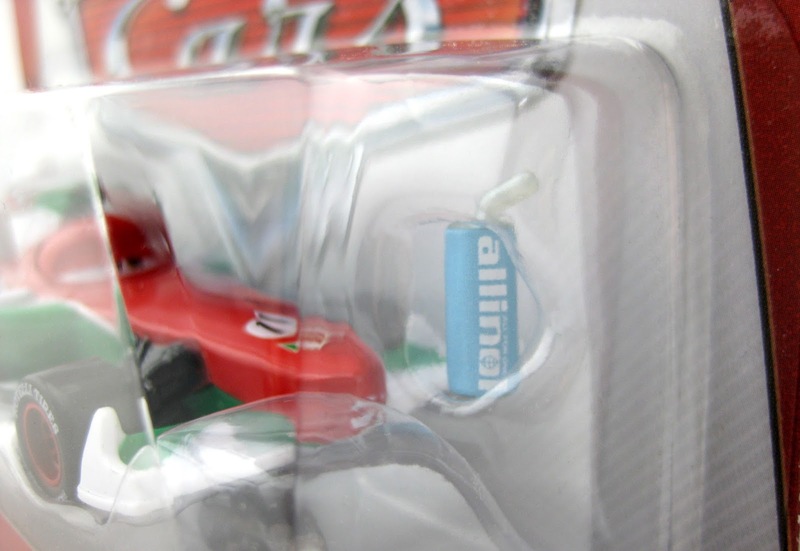 However, the reason I say this one is an exciting find is simply because it's a "Super Chase" release, which basically just means it's ultra rare (no more than 4,000 units are produced). Super Chase cars are extremely difficult to spot in stores, so I'm thrilled to have finally found this one! This pack was released in late 2014 and, per usual, is a 1:55 scale diecast from Mattel. There are are couple of problems I see with this release, but I'm willing to overlook them because of this car's "super chase" nature (I'm a sucker for the rare cars, whether or not they are totally screen accurate). First off, Francesco didn't have a can of Alinol during this scene in the film (he had Alinol next to him, but it was in a cocktail glass). 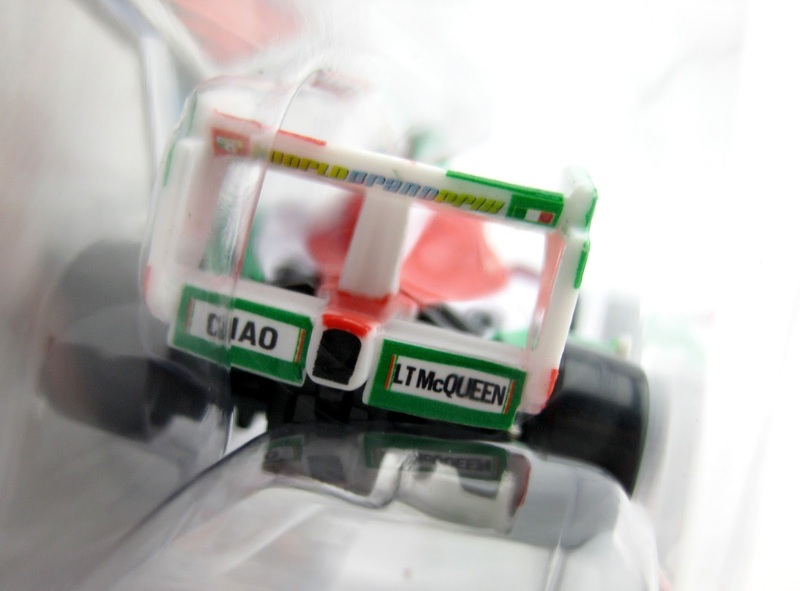 Secondly, his bumper sticker (as shown in the screen shot above) reads "Ciao Mcqueen", not "Ciao LTMqueen"...but like I said, oh well! If you're interested in the other Super Chase cars out there, check out my other posts on Yukio, Hiroaki, Takeshi, Carateka, "95" Race Fans Luigi & Guido and Trike Feldman. Look for a few more here this year as well! If you're still looking hard for for this one, but never found it in stores, be sure to hit up eBay HERE or Amazon using the direct link below. Good luck on the hunt!